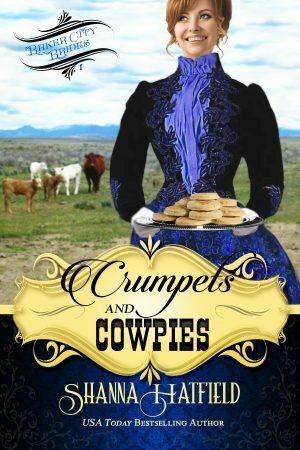 “In Crumpets and Cowpies by Shanna Hatfield, the year is 1890; the Crumpet is Lady Jemma Bryan; the Cowpie is Thane Jordan. We first meet Thane as he arrives in England to settle the estate of his dead brother, Henry. The will is read and Henry has left everything to Thane; his money, his business interests, his home and, most importantly, his two young children, Jack and Lily. Jemma is the children’s aunt and has been caring for them a very long time, since their mother took ill and died. Thane and Jemma immediately dislike each other and do a lot of disagreeing and name calling. Jemma is now going to have no home and no money. She will be saying goodbye to Jack and Lily as they prepare to travel back to Baker City, Oregon, with their uncle. Thane knows he is not prepared to care for two children on his ranch and feels guilty leaving Jemma with nothing. He does the only thing a gentleman can do and proposes marriage with a promise to never enter her bed. Jemma has no other option but to agree and soon they are all on a ship headed for America. But will this arrangement work out? “Thane Jordan is forced to go to England after the death of his brother, Henry, in order to settle the estate. Irritated that he can’t just do it by letter and telegram, once he arrives he finds things are more entangled than he could ever have dreamed. Jemma, Henry’s late wife’s sister, has taken care of everything and everyone for years, and is horrified by the uncouth man she sees before her. Henry was a kind, true gentleman; Thane is a heathen. Going home to Eastern Oregon, with people, and things, and a dog, was not something Thane planned on. Thane and Jemma are a perfectly snarky fit for each other, able to fling era-appropriate zingers with a passion and precision seldom done so well in a historical. Rare for a book of any kind, the children and animals have just as large a part of the story as Thane and Jemma themselves, and that just makes the world in Eastern Oregon come more to life…The setting of the small up-and-coming town, and the surrounding cast of characters have created a rich and vivid world, with more than enough to spin tales about this family and town for years to come. Those tales would be at the top of any readers’ lists! “Have you given our conversation any consideration, Miss Bryan?” Thane asked, watching her closely. Although she maintained her perfect posture, he detected a slight squirm as she sat on one end of the settee. Rigsly must have sensed her discomfort, because the dog rose to his feet and plopped his big head on her lap, whimpering. She lifted one hand and absently stroked his head while setting down her tea with the other. Lady Jemma Bryan might be a freethinking nuisance, but she was one of the most graceful and polished women Thane had ever met. As he admired the curve of her cheek, the length of her neck, the elegant form of her fingers, he unexpectedly wished he could be the dog.